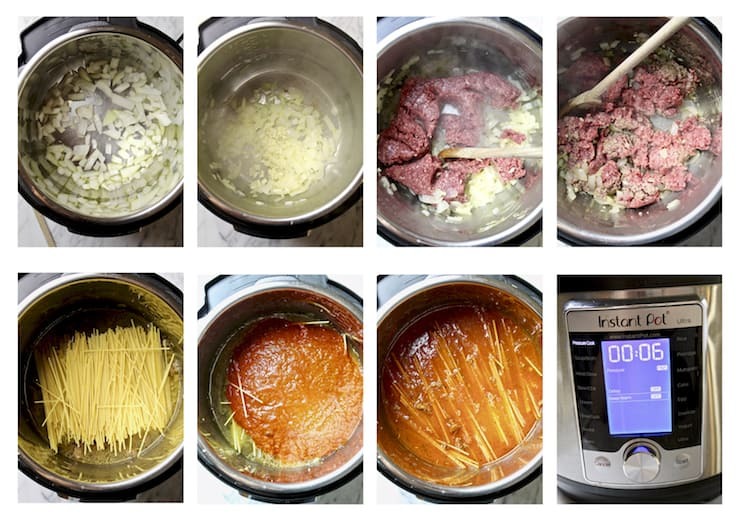 Instant Pot Spaghetti with meat sauce, all in one pot. Use ground beef or turkey, your favorite marinara sauce and dinner is on the table in 30 minutes. Oh, how I’ve had fun learning the ins and outs of pressure cooking the past few months, and spaghetti has become a weeknight favorite around here. It’s easy and quick ~ everything cooks together in one pot ~ and so good. 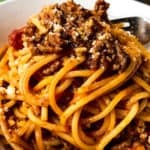 Instant Pot Spaghetti with Meat Sauce is perfect to get on the table in under 30 minutes, any day of the week. I have made this with ground sirloin and also with ground turkey, I love it both ways. Meathead is probably more fond of the beef but honestly, the turkey was just as good and my girls all loved it that way. Use what you like or prefer. 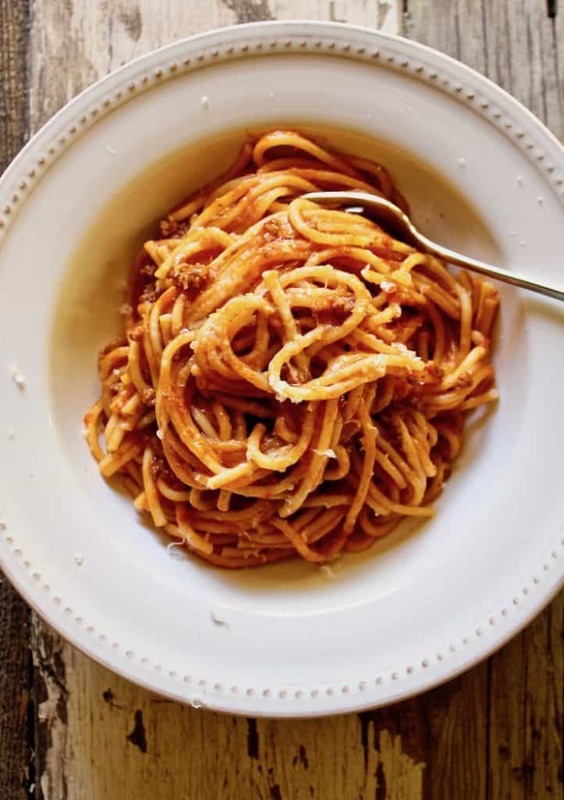 So simple, just brown the meat with some onion, garlic and a little seasoning, and then add water, spaghetti, and your favorite jarred pasta sauce. Set the pressure cooker for six minutes, let it sit for six more minutes and then it’s done!! How easy is that? (I sound like Ina, ha!). You can use more than a pound of ground meat and I often do, usually up to 1⅓ pounds of ground meat. 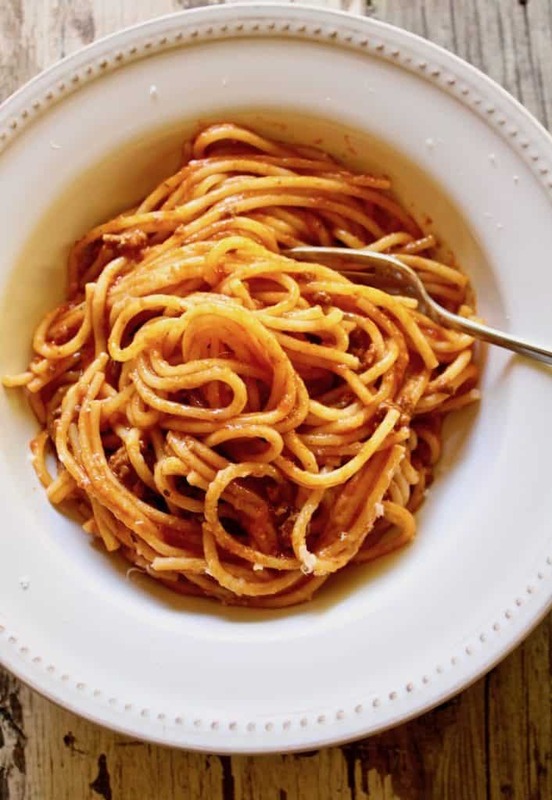 You can also use less spaghetti, but if you do, lower the water amount to 2½ – 2¾ cups. It’s kind of trial and error, but I like a saucy sauce so I keep the water at 2¾ – 3 cups. I kind of find pressure cooking to be more “exact”, like baking, with ingredient amounts, etc. That said, this has been a forgiving recipe and the pasta, meat and water amounts can be adjusted easily. Watch seasoning amounts ~ seasonings and aromatics are more intense cooked under pressure. Be careful on how much crushed red pepper you use!! Some other Instant Pot dishes that you might also like to try are Pho Ga, Easy Barbecue Ribs and Country Green Beans, Potatoes and Ham. 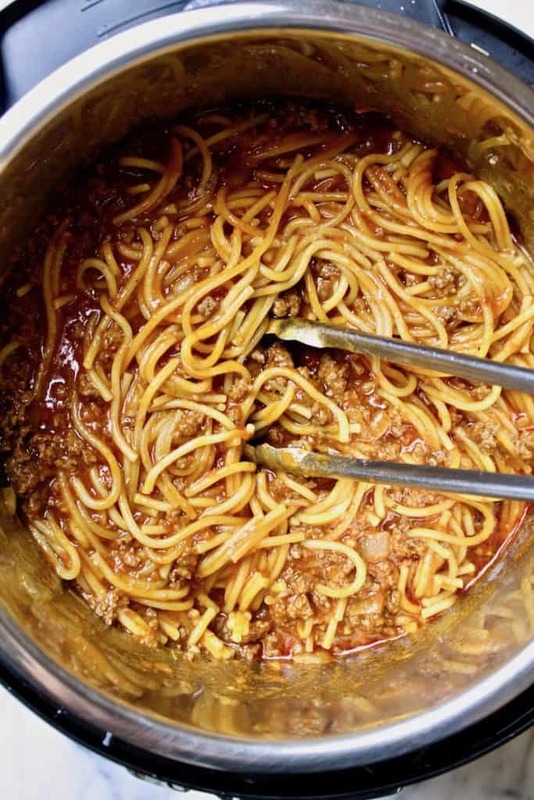 If you’ve tried this Instant Pot Spaghetti, please rate it below in the comments and let me know how it went ~ I love hearing from you! HUNGRY FOR MORE? Subscribe to my Newsletter and come hang out with me on PINTEREST, INSTAGRAM and FACEBOOK for all the latest updates. 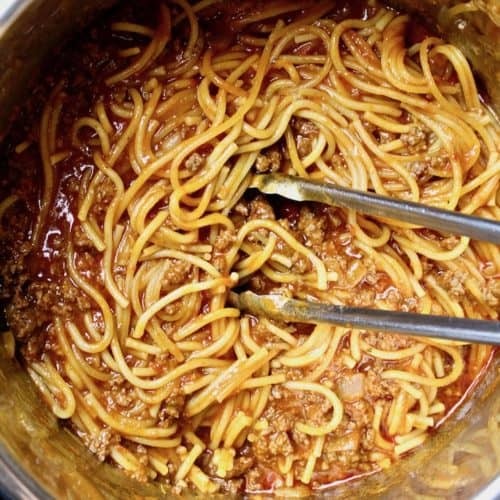 Instant Pot Spaghetti in Meat Sauce, all in one pot. Use ground beef or turkey, your favorite marinara sauce and dinner is on the table in 30 minutes. Turn on sauté feature on Instant Pot and heat olive oil until hot. Add onions and cook until translucent. Add garlic and stir for just a bit until fragrant. Add ground turkey and continue cooking and stirring to break up clumps until browned and no longer pink. Add the Italian seasoning, crushed red pepper and a sprinkle of salt and pepper. Stir to combine and cook another minute. Turn off sauté setting. Add water and 1 teaspoon salt to the pot. Lay spaghetti on top and then cover with marinara sauce. With tongs, carefully and gently toss to combine, making sure all the spaghetti is covered with liquid. Secure lid and seal Instant Pot. Set for 6 minutes on high pressure. When finished, let pressure naturally release for 6 more minutes (set a timer!). Manually release remaining pressure and carefully remove lid. With tongs, stir and toss to combine spaghetti and sauce, carefully breaking up any clumps of pasta. Taste and adjust for salt. Serve with plenty of freshly grated Parm and Enjoy! I have often used more ground meat, up to about 1⅓ pounds and it works just as well, in fact, we prefer a little more meat! You can also use less spaghetti, like 12 ounces. If so, drop the water down a little, to 2¾ cups. Pressure cooking times and pasta varies, a good starting point is to cut the package boiling instructions in half and set cooking time to that amount, followed by the same natural release time. I recommend the 6 minutes based on De Cecco brand and my al dente preference. *Inspired by Cooking with Curls. Very delicious. Added some mushrooms and onion & garlic powder too. I added a little less than a pound of spaghetti. Hubby said its yummy a half a dozen times. Hahaha!! So glad you guys like it. I make it all the time around here, my family loves it! This is one of my family’s favorites. I’m making it for supper tonight with a couple extra people coming to join us. My question is, do you know if I doubled the recipe, would it turn out in a 6 qt IP. I’m contemplating cooking all of the onions, meat, etc. and then taking out half of the meat mixture and making two separate batches. Of course would be so much easier if I could just do the double batch and be done. I’m not sure about doubling this recipe. As long as it doesn’t go above the fill line in the insert. I think it might be too much for a 6-quart pot. I’m glad you like the recipe ~ my family loves it! Oh!! Forgot to rate this recipe. Love it!!! I use a 6-quart model and it’s a good size for everything I’ve tried in the Instant Pot. Just made this for my hubby and I-only the 2nd meal I have attempted in my new Instant Pot 6qt. It was delicious!!! I followed the directions to cut down on the amount of pasta (12oz) and used 2 and 3/4 cups water. Also followed hint to cut boiling time on box in half-and it was perfect!!! I used Barilla thin spaghetti and set for 5 minutes pressure cook and 5 minutes natural release and the pasta was cooked exactly the way we like it!!! Sending this recipe to my daughter in law and sharing with friends!! Thanks for the detailed directions!! They really helped this newbie!! Hi! Thanksgiving for the recipe. I have tried one-pot pasta in my multi cooker before and all the pasta clumped together while it was pressure cooking. I wasn’t able to stir it a minute or so in to help separate the strands. I was wondering if you had any tips on how to stop this happening? Thank you! The pasta clumps a little bit but I have had no problem when I stir it and the strands easily come apart. When you put the sauce over the pasta, carefully make sure all the strands are coated and submerged before you seal the pressure cooker. Can you use quick release instead of natural release? This is my first time using the Instant Pot. Instruction booklet says natural release may take 10-40 minutes until the float valve drops. 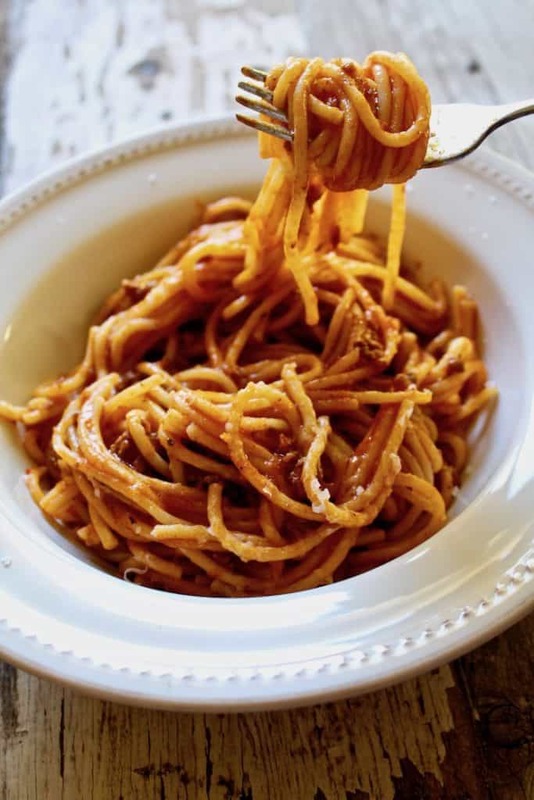 With this spaghetti recipe, you want to quick release after timing 6 minutes from when cooking stopped. So when it beeps that it’s finished, set a timer for 6 minutes and then do a quick release. I’m trying this tonight in my Ninja Foodie. Life got a lot easier since I got an IP ! Thanks for the recipe .